The Beyoğlu neighborhood sits at the heart of the European side of Turkey's largest metropolis. 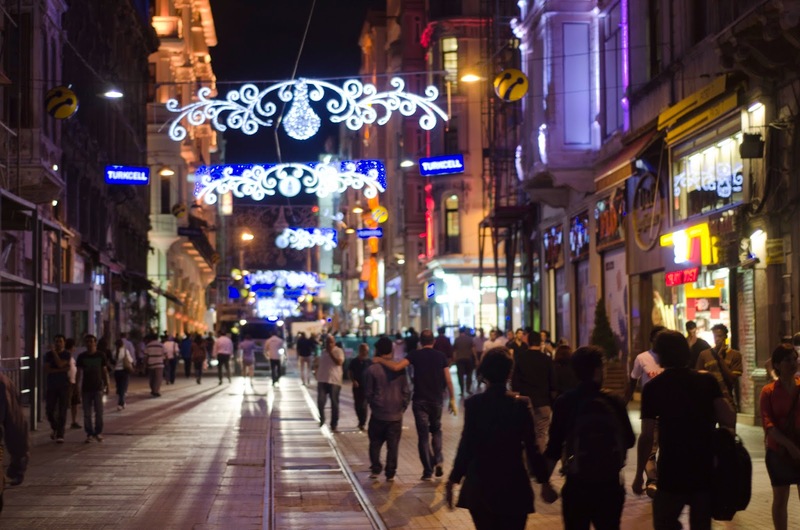 Since the late nineteenth century, İstiklal Street (formerly called Pera) has served as a populous promenade for residents and tourists alike. Today, walking in Beyoğlu between the crowds and the "Nostalgic Tram" that runs up and down İstiklal is a fundamental experience for any visitor. The glamour, excitement, and consumption that have come to define the Beyoğlu neighborhood are one side of this story, but in this first lesson, we'll explore the other. Our singer, Yaşar Kurt, recorded this song entitled "Hünerli Çocuklar" or "Talented Kids" of his album Street Songs (Sokak Şarkıları) during the mid-1990s when Beyoğlu was transforming but yet to become the area it is today. It touches on the lives of street kids, who appear in the song poor, depressed, and caught up in activities such as huffing paint thinner or tiner, the quintessential symbol of troubled youth in modern Turkey. The title of the song "Hünerli Çocuklar (Gifted Children)" is put in contrast with the subject of the song, which is "Tinerli Çocuklar (Children With Paint Thinner)". The socioeconomic situation of Beyoğlu has changed quite a bit since those days - as has the life and career of Yaşar Kurt - but the street kids with paint thinner will still be found on the margins of the bustling economy of this Istanbul neighborhood. Don't worry about everything in the lyrics. I've selected this song for the sentence "Beyoğlu'nda yürüyorum" or "I am walking in Beyoğlu," which utilizes the present tense -yor ending. Note that the suffix "-da" refers to "in" or "at", but in this case a helping "n" has been added. If you aren't familiar with this grammatical rule, don't worry about it at the moment. Just remember when you're meeting with friends in Istanbul to tell them "Beyoğlu'ndayım" for "I'm in Beyoğlu" and not "Beyoğlu'dayım." This will be the only lesson on the continuous present tense ending -yor, which is not the tense most commonly represented in song lyrics, though it will certainly come up in many of our lessons. Here is a conjugation of two of the verbs in the song yürümek (to walk) and ağlamak (to cry). Use the flashcard below to review the vocabulary. Click on the words to hear their pronunciation. Vocab audio courtesy of Seçil Yılmaz. See how yürümek becomes yürü-yor(present tense)-um(I). Normally a noun with a locative suffix such as "Beyoğlu'nda / In Beyoğlu" comes at the beginning of the sentence, but for emphasis or poetic effect, it can be moved to the end of the sentence as we see here. "Ölüm gibi" means "like death." When he says "something like death is happening (oluyor)", perhaps he means that it feels like death as we say. Note that the word for "like (gibi)" comes after the noun. The verb çürümek means "to rot or decay", but here what Yaşar Kurt is saying is that the sight he sees wears him out emotionally. He could have said this in many other ways, but çürüyorum rhymes with yürüyorum. Again, see how "ağlamak" becomes ağlı-yor(present tense). There is no ending on the verb for the third person (he/she). On the backstreets of Beyoğlu, there are talented children. Recognize the special verb at the end of the sentence "var", which means here "there is/are." We will deal with the -dır suffix later. "Çalmak" means both to "steal" and "to play", as in an instrument or sound. Here, the meaning is "to steal". "Türkü söylemez (they don't sing songs)" is from the verb söylemek (to say). Note that its conjugation is different from the present tense verbs above. That is because it is a different verb tense that will be dealt with later (advanced point: Also note that "çalmak" here comes in the meaning of "to play" rather than "to steal"). If these children were the sky, they would stay blue even at night, oh these children. Not everything should be explained. I'll leave it to you to ponder what Yaşar Kurt means by saying that "if these children were the sky, they would stay blue even at night." Before moving to Lesson 2: Essential Things, work on this quiz below, which will help you learn the lesson's vocab as well as improve your typing skills (click here to learn about typing in Turkish). This is very exciting for me to try as I visit Istanbul every year and find it very difficult to learn languages. However I cannot get the song to play.